Raleigh’s rules for electric scooters are in, and by my reading it appears Raleigh did opt for overregulation, as I warned. Worse, it seems as if city officials might be trying to interfere with their business model so as to make the things infeasible. If so, it would be a passive-aggressive de facto ban. Granted, that could be an unintended negative consequence of trying to repurpose the recreational tools (see “Equity” requirements in the list below). Some items would be expected, such as bonding and insurance; stipulations that riders do sensible things like keep off sidewalks, wear helmets, not be intoxicated, etc. 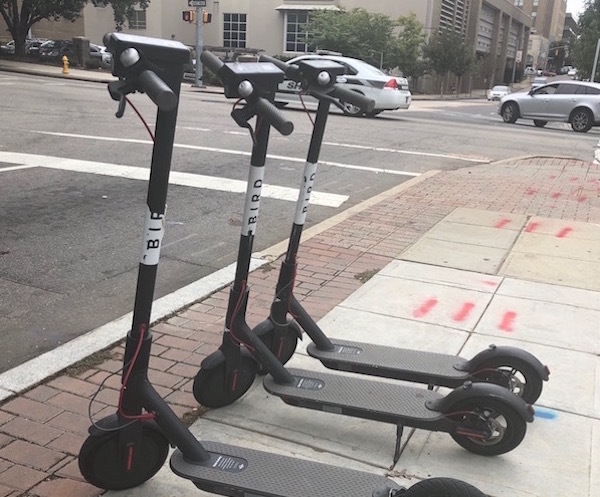 (many if not all items that are already listed on the scooters); docking and parking rules; providing ways city officials can contact scooter company staff; and other things. Fees of $300 per scooter (these are in addition to application and administrative fees). Minimum number of scooters per company: 50 (which the city can revise any time). Maximum number of scooters per company: 500 (which the city can revise any time). Providing monthly reports to city officials on rates, discounts, trips, distances, instances of vandalism, complaints and resolutions, uses, and users (“anonymized”). Provide additional data to a third-party researcher of the city’s choice that would include even more information, including customer demographics (gender and age). What if the electric scooters persist? Now if Bird and Lime are able to work around these new regulations, they would no doubt benefit from overregulation insulating them from upstart competition. All these new costs (as well as imposing an adjustable minimum level of scooters by company) would work to prohibit new entrants to the market. At which point they would have a financial interest in keeping the regulations, and consumers would lose again.